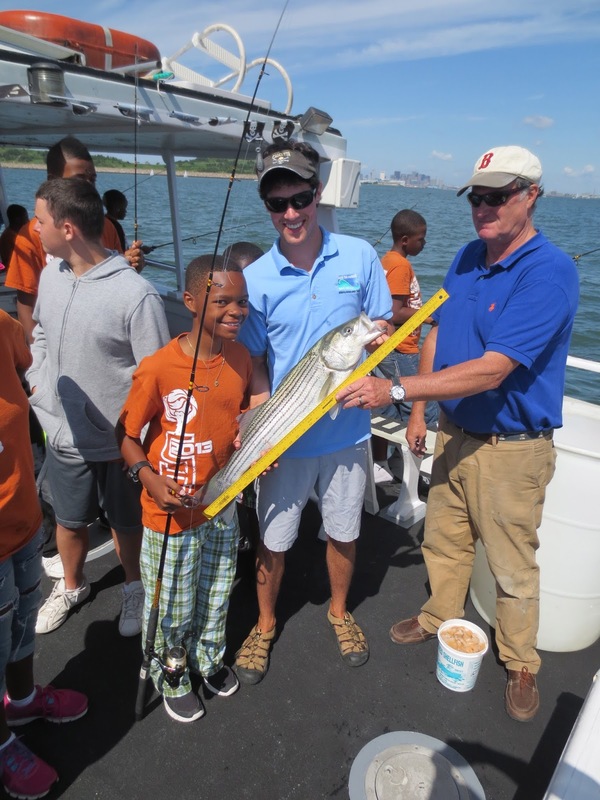 This past Friday my team and I took the fishing club from this session at Camp Harbor View out on The Belle for a day of fishing. A special thanks goes out to Captain Charlie, and John, the first mate. These guys were exceptional with the kids and made sure that everything went as smoothly as possible. Friday was my first time really getting to talk to them this year and it was apparent just how much they know about the Harbor, a fact that is made even more clear by the quality of the boat ride they provide. 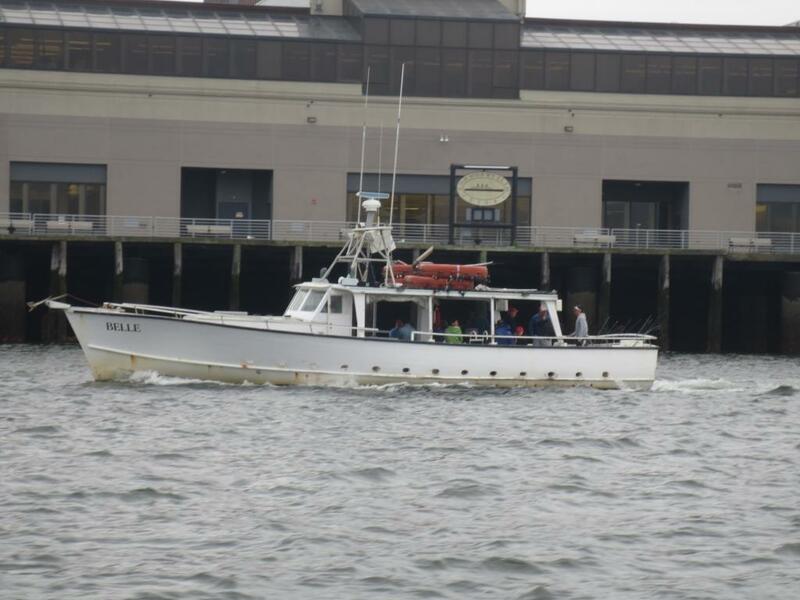 For all of those reading the blog who may be looking for a charter for either a fishing trip or pleasure cruise, look no further than The Belle, Charlie and John will make it a fun, worthwhile experience. The day started with a bang. 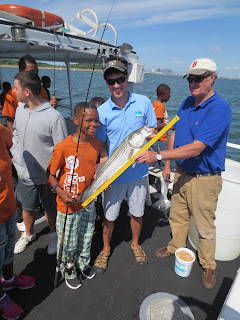 Only minutes after we dropped anchor at our first location, right off the shores of Long Island, one of the campers felt a heavy bend in his rod. At first we thought that he had just hooked bottom, but a then the rod began to vibrate with the powerful head-shakes of a striper. The camper was behind one of the window pillars, and as the fish ran hard for the bottom and towards the aft of the boat, I was concerned that he was going to lose it. Quick thinking by Will Conroy saw the rod maneuvered into a more favorable fighting position, and after a long battle the fish was pulled alongside the boat where it was netted by Captain Charlie. A quick measurement and it was confirmed that the fish was indeed a keeper. Tristan with his exceptional catch. Unfortunately the rest of the trip was marked by much slower fishing. A few of the other campers managed to hook into bluefish, but they were all small and could not compare to the first catch of the day. Even when one of these small blues was baited and allowed to swim behind the boat we could not convince another large striper to bite. 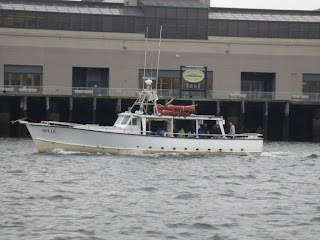 As we turned around and headed back towards the docks of Camp Harbor View I set to work processing the days catch so that Tristan could take it home. As usual all of the campers were fascinated and extremely inquisitive about the entire process and the anatomy of the fish. Fortunately for everyone on board, Tristan, is an exceptionally friendly and generous guy and was willing to share this catch with whomever wanted a piece. As a result everyone ended up going home happy regardless of whether they had caught a fish or not. A fellow camper holding up her gift from Tristan.